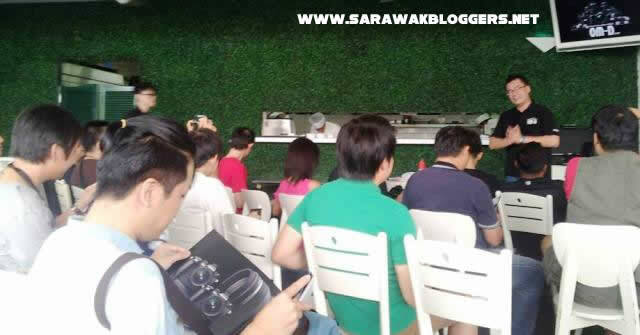 Olympus took the opportunity to introduce a new line of their OM-D amazing camera models last Sunday with Robin Wong, a blogger affiliated to Sarawak Bloggers giving an hour worth of introduction. The session which was attended by some 50 camera enthusiast was made possible at a leading food and beverage outlet in the city, with many of the attendees eager to test out what the new E-M1 has in store. Robin who now works after Olympus, gave a brief but interesting presentation on the what makes the E-M1 better than other models in the market, as he pointed out the importance of having a ‘professional camera’. Among those pointed out was how the E-M1 was made of a complete alloy frame, the speed of its burst and the ability of the camera to withstand water damage when used under the rain. The session also allowed attendees to test the new camera and its lenses, with the final part of the whole session ending with a ‘shutter therapy’ session.